Is Microsoft Mail for Windows Worth the Download? 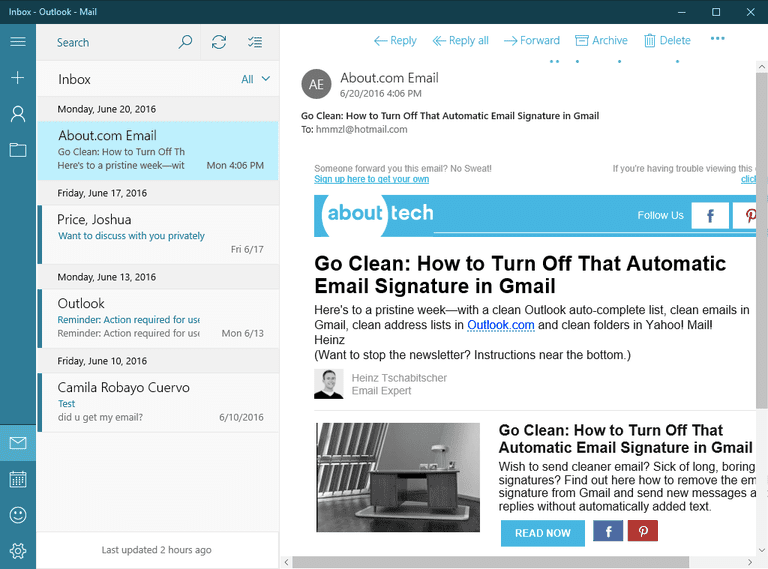 Mail for Windows is a basic email program that lets you handle email in multiple accounts with ease and security, though it lacks more sophisticated features. You cannot set up filters, for example, email groups or message templates. Mail for Windows lets you set up multiple email accounts, and they can be of various types: in addition to the classic (and rapidly disappearing) POP accounts, Mail supports IMAP (such as Gmail or iCloud Mail) and Exchange (such as Outlook 365). With IMAP and Exchange, all messages and folders are kept on the server, with which Mail then synchronizes. When you add a new account and by default, Mail for Windows configures it to synchronize only messages from the last month (or the last three months). This is a smart strategy, of course. How often do you really look at messages you received more than three months ago? So, not keeping these emails locally on the computer saves not only time and bandwidth synchronizing as well as tons of local disk space, but it also saves you from messing with these old emails. Of course, Mail for Windows lets you change the synchronization option to have all messages available in all folders. Of course, Mail for Windows should make this obvious and a more straightforward thing to change. Mail for Windows lets you manage mail in multiple IMAP, Exchange, and POP email accounts. For each email account, you can configure how much mail (including a week as well as a month back and without limit) is synchronized, preserving local storage; the setting applies to all an account's folders. An (optional) adaptive synchronization schedule balances getting new messages at once with preserving battery life on a laptop. Multiple accounts' inboxes and folders can be combined into a unified account that lets you access all mail in one place, and Mail for Windows can organize messages in a conversation as threads. To protect your security and privacy, you can configure the Mail app to not download remote content automatically. An easy to use message editor lets you add rich formatting including images to email text; Mail for Windows also supports email attachments. For each account, you can create an email signature, which is automatically added to emails as you compose them. Simple search lets you find text fast in full message text and across folders; search operators to narrow results are not available, though. Integration with Calendar has Mail recognize dates and times for events in emails and lets you add them to your schedule easily. Using the interface to Outlook Mail’s vacation auto-responder, you can set up an Outlook.com account to reply to incoming messages automatically on your behalf. Mail for Windows can notify you of newly arrived emails using the Windows action center using a banner or sound. You can pick the interface color and a background image for the Mail app window and switch between a light theme for the day and a dark one for the night. Mail for Windows supports Windows 10. Whatever you think of it, Mail for Windows tries to be conscious of the resources it uses. It does not check for new messages more often that it deems necessary either, for example, a "smart" schedule adapts to how often you receive new mail and how frequently you deal with it. Yes, you can pick your own schedule. Assuming you did get your emails into Mail app, what can you do? Reply, archive, delete; if you look a little, Mail for Windows also offers a shortcut for marking an email as spam. When you do reply or write a new message, you will find a comfortable and useful editor that lets you apply to format easily. You can add images, of course, and attachments. A bit surprisingly perhaps, Mail app does not directly integrate with OneDrive (or other file-sharing services) for sending files that stretch the bounds of classic attachments. Something else commonly attached to emails' ends is signatures. Mail for Windows lets you add yours — in the somewhat rudimentary manner we may come to expect from it: you get one text signature per account (no images and no links), and it is either automatically included or off; you cannot set up multiple signatures per account or choose just when sending. So, signatures cannot act as text snippets in the Mail app. Unfortunately, nothing much else can either. Mail for Windows does not offer message templates, text modules or suggested replies. As for other automation, Mail does not offer much either. You cannot set up rules for local mail filtering in it; Mail for Windows cannot sort or mark mail based on senders; and you cannot make it file messages you send based on the recipient, for example. You cannot set up Mail for Windows to apply labels or categories using filters either. This is because, again, there are no filters — and because there are no labels or categories. There is, alas, no postponing messages either. For organizing mail, Mail app gives you folders and search. Folders work as they should, and moving messages is easy enough using dragon and dropping or the toolbar. A bit oddly, there is no keyboard shortcut and a tad annoyingly, moving messages between accounts is not possible (neither is copying messages at all, by the by). Search, in Mail for Windows is, on the whole, a satisfying experience. This is due in no small part to the simplicity: you enter your search terms; you press “Enter”; you get results. Mail app lets you search either the current folder or the account (though not across accounts). Most usefully, perhaps, you can send Mail to continue the search online at the server and return all results. This is a way to access mail not synchronized to the computer and a particularly useful one. If it is precision you crave in your search and results, you will probably miss search operators, filters, and sorting options. Search is still eminently useful in Mail. Back at the inbox (or any other folder), you may miss those sorting options as well. Mail app always shows messages sorted by date. You can filter folder to reduce them to just unread or flagged messages, though. With more than one account set up, you will find yourself switching between accounts—or have Mail for Windows merge them. With "linked inboxes", you get combined inboxes, sent mail and archive folders, etc., which appear as one big account. With accounts thus merged, you can even search across accounts, though results can become a bit confusing as messages do not indicate their origins. Whether your inboxes are kept separate or merged, Mail for Windows lets you set up and configure actions for swiping across a message. You can pick from archiving and deleting or marking mail as junk, for example. Unfortunately, similar configuration options do not exist for the toolbars and context menu actions available — and those available can seem a bit haphazard at times. They work well enough, though, and you can at least take most of the actions you want. The same, alas, is not true for keyboard shortcuts. Even in a program that also works well with a screen (and no keyboard) to touch, a full range of keyboard shortcuts should be more than a mere afterthought. Mail for Windows comes with a set of shortcuts that is familiar enough in places but has gaps like moving mail, as mentioned before or using “Space” to read mail by the screenful. No Opening Mail and Drafts in Separate Windows? Speaking of the area that has Mail app display your messages: whatever the device, no way to minimize or otherwise move out of the way a message draft while composing it so you can quickly refer to, say, the original message and then return to the draft is simplicity and focus gone too far; on a large screen, it is silly. Mail for Windows does not let you open emails you are reading in separate windows either — or, if there is a way, it has remained obscure to me. Help for Mail app is limited to a few hands full of questions. Mail for Windows comes with Calendar as a sister application, which works well enough to synchronize and manage your schedule. If Mail app detects a time and date in an email, it can help you create a new event in the calendar with the time pre-set and the email’s subject used as a title. Unfortunately, that is about all the integration there is between the two programs. People keep contacts for the Mail app, and integration is similarly limited. It is also unfortunate that Mail (or Mail in conjunction with People) does not let you set up contact groups so you can mail multiple recipients with ease. There is not even a true contact picker in the Mail app; it’s all auto-completion. Mail for Windows is a basic email program that lets you handle email in multiple accounts with ease and security, though it lacks more sophisticated features. You cannot set up filters, for example, email groups or message templates.